Huge Family Home! Walk to Bayside Ocean Beach or Lake-One Block!!! Central Air! 5 Bedrooms + 2 BR In-Law Apt, 3 Baths, 2 full Kitchens+Bonus Rooms - expandable! Huge Vacation Rental Family Home! Central air conditioning throughout main house and in-law apartment..Walk to Bay side Ocean Beach near Kingsbury Beach and we are near Historic First Encounter Beach or freshwater lake at Wiley Park location across the street!!! Wiley Park lake is crystal clear, has docks for fishing in the summer with an enclosed summer children's playground! See photos! Sleeps 11. Friday to Friday rentals only during high season! Please email with questions or call Joe 508-868-7828. 2018 May 25 Memorial Day weekend, June 1, 8th-15th, June 15-22h: Main House $3,850/week/In-Law Apt: $1,200 FRIDAY-FRIDAY rentals! CALL-SPECIAL RATE FOR 2 or more weeks and for those renewing lease year after year. Check in: 2 pm Check out:10 am Special Weekend Rates available off Season-please call or email-3 night minimum $550/night. Add the In-Law apartment with the main house rental to expand your space and have more areas for visiting families and kids! This area is available ONLY with the main house rental - otherwise locked off. The downstairs area is a huge recreation area with ping pong table and pool table for family fun! Add the In-Law apartment with the main house rental to expand your space and have more areas for visiting families and kids! In-law area. is available ONLY with the main house rental - otherwise locked off. Total Bedrooms with In-law Apt: 7 with 3 Bathrooms total. Special Weekend Rates available off Season-please call or email-2 night minimum $550/night. Beautiful, roomy, newly completely remodeled home on the bay side of Eastham, near the famous historic First Encounter Beach, National Seashore Museum and Nauset Lighthouse! Walk out the backdoor one block to Kingsbury Beach and across the street to the freshwater lake pond at Wiley Park - complete with fishing, dock, playground and public facilities! WC ramp to the water. Huge enclosed playground for kids! Family Place for everyone who loves the beach! : Families with small or grown children welcome...Freshwater pond at Wiley Park is crystal clear and very clean. The new playground at Wiley Park also as fishing docks and clean new restrooms. Great alternative when the tide is out! Easy bike ride to Cape Cod Canal Bike Trail or other activities. Great home location! Main house:: Has a total of 5 bedrooms, 2 bathrooms and is very roomy with lots of living room and a lower level game room play room area (pool table and ping pong table with TV). Large mud room for gear and three huge sliding glass doors to outside deck that is huge! Plenty of room on the outdoor patio furniture to gather with the families and kids. Hardwood floors on the main level with brand new carpet upstairs. Sky blue tile in lower level bedroom and game room area. Expand the house!! Total 7 bedrooms 3 bathrooms!!! In-law apt: 2 bedrooms, 1 full bathroom, full kitchen-all brand new- has sleeping facilities for 8 persons in beds. One queen bed, 2 twins, trundle bed twins, and queen sleeper couch. In-law apt rented only in conjunction with the main house-not rented separately. Home is immaculately clean, clean and clean!!! Fantastic location! The outdoor deck is approximately 20' x 16 ' and accommodates large groups of children or adults. There is a Webber grill on the deck to enjoy your outdoor cookouts! The lovely outdoor shower is convenient when returning to the home from ocean or lake! Large outside lawn area with a sand area for kids. In-law apt attached to main home is very convenient. Main house with 5 bedrooms and 2 baths can be rented only in conjunction with the in-law apt. with separate entrance that has 2 additional bedrooms, full bath and lovely kitchen with queen couch and trundle beds that can sleep 8 persons. Please note: The in-law apt. (above garage) is rented only to the main house rental persons at the same time to accommodate large groups. Otherwise, it is locked off for access and not rented to anyone else. We are Cape Cod lovers that enjoy the ocean and are happy to share our home with families and kids! Many of our families have rented from us over 16 years and counting! Our unique location with a short walk in between Great Pond and Wiley Park and Kingsbury Beach makes it a wonderful family gathering for all ages. Main House: Two full bathrooms. Master bedroom bathroom is full handicap access with huge double shower over 5'. Outdoor shower is great for coming from the beach! In-Law Apt: 1 full bathroom with shower and tub. Only one block from Kingsbury bay beach and the famous First Encounter Beach and marshes are a walk up the beach! Across the street- freshwater pond with plenty of docks, fishing and playground! Across the street is Wiley Park and the lake with a huge park for kids, docks and swimming areas. Lots of fun with additional trail hiking! Air Condtioning in main house and in-law apt. Nice, cool even temperature during the summer. Bosch diswasher in main house. Wolf 44' stainless steel range with double grill, new double wide refrigerator, Bosch dishwasher, beautiful Italian tile kitchen. A lovely gourmet kitchen! Huge brand new TREX deck 20 x 16, expansive patio furniture with umbrellas. Limited access-ramp into the house and main floor bathroom is double wide shower with low lip. Please see photos. Handicapped accessible. Absolutely no smoking or pets on property. Lake and Picnic area with enclosed playground and facilities across the street, Historic First Encounter Beach, Nauset Lighthouse, 20 minutes to Provincetown, National Seashore across Rt, 6 approximately 5 minutes from home, Bike trail one block away! Bring your fishing gear!!! 2 Fireplaces, 1 Phone line, Full Gourmet Kitchen with Wolf Stainless Gas Stove and Grill Cooktop, Bosch Dishwasher, Huge GE Refrigerator, Gourmet Cooking Utensils, Ice crusher, lobster pots, cooking pans provided, Maytag Washer and Dryer, Webber Gas Grill (BBQ) is on the deck, this house is smoke free and pet free! Immaculately clean!, We have pride of ownership and lots of repeat customers!, Use Maytag Washer with 1/8 cup of laundry detergent only as it is a high-efficiency front loading washer, Bosch dishwasher allows maximum capacity for large groups, Wolf gourmet gas stove has a grill as well as burners 44' cooking surface. The house was just right for our three generation 12 member family. It was spacious, clean, well equipped and maintained. There is an easy walk to the bay beach and the pond/playground; the bike trail and seashore are nearby. Marie, the owner, was lovely and helpful. Everyone enjoyed the week. We would highly recommend this house to anyone interested in this size property. My family (3 generations) had a wonderful time at this house. Kitchen was well stocked with utensils, dinnerware, pots and pans, etc.. Layout of the house was perfect for a large family. Everyone had their own space. Deck is huge and backyard is big-we played yard games everyday there. Across the street is Wiley Park with a playground and a pond-perfect for families with young children. Location was perfect-close to beach, miniature golf and good restaurants. The owner of the house couldn't have been nicer or more thoughtful. My family and I look forward to spending next year at this house. Thank you for the pleasure of working together to make your family stay a perfect Cape Cod Vacation. Our family appreciates the lovely review and we look forward to your vacation with us next year! We do aim to please! The house was perfect! We are a large family and there was room for everyone! I don't know which the grandkids enjoyed more- the beach or pool and ping pong! Marie was so caring and concerned that we have a great time. I can't think of anything I would change! We hope to be back next year! Thank you and we enjoyed having you as our guests! It's always wonderful to work together with your lovely family, I'm glad that our home made your Cape Cod vacation so special! See you next year on the beach! For our yearly family reunion, this place is absolutly perfect. A 5 minute walk down a path to the beach, a 5 minute walk across the road to the pond, a 5 minute bike ride to the bike trail, a 10 minute car ride to shopping or restaurants or national seashore, or if you really want to explore the Cape, you're pretty much right at the epicenter of whatever you might care to see. Our clan has children between 5 and 20, parents in their 40s and 50s, and matriarch and patriarch, and there is always something for everyone. There is a wheel-chair ramp and bedroom on the ground floor, a game room and bedroom in the basement, bedrooms upstairs, an absolutely fabulous kitchen and deck off the back with tables and space for a crowd. The place is very clean, very well maintained, and the owner is always accomodating and a great communicator. We've stayed at a number of places on the Cape over the years, but this is the best; we plan to keep coming back as long as we are able. 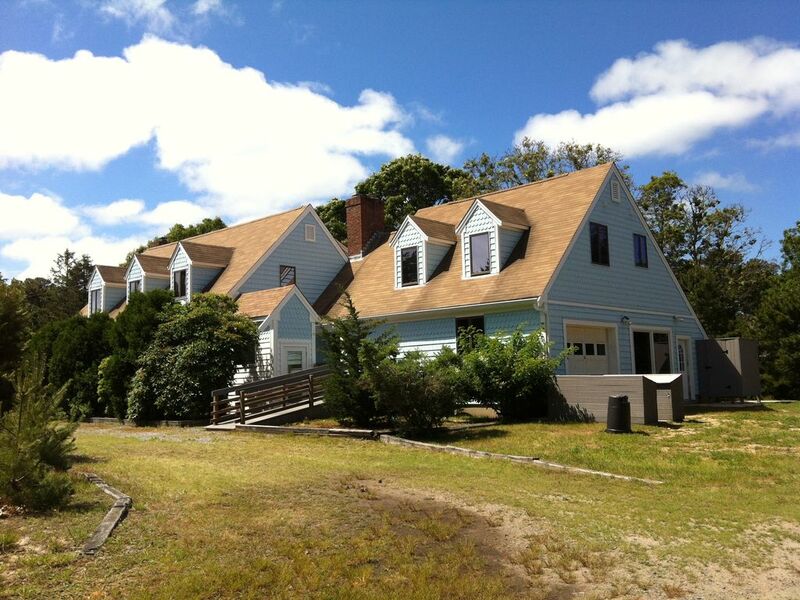 If you've got a big group and you want a great place to stay together on the Cape, stay here. We sure aim to please and thank you so much for your appreciation of our family home! We look forward to welcoming you and your lovely family each year. Have a wonderful Cape Cod vacation from our family to yours! My family, my brothers and their families all stayed here for one of the most memorable vacation weeks of our lives. The house was absolutely incredible. Everything was up to date, every bed was comfortable and everything was tastefully decorated. Plus there is so much room we never felt on top of each other. Marie, the owner, was also amazing to work with. My wife and I had a ton of questions beforehand and Marie was incredibly responsive and accommodating. We LOVED our stay at this property and would go back in a heartbeat. Thank you so much for trusting us with your family vacation! We are so delighted that you found everything in order and your family had such a fun and relaxing time. We look forward to your next vacation visit with us! We had a wonderful stay at this clean, large home! We rented the in-law apt as well, and that was perfect for our little family with our 2 young children, they were able to nap and relax away from the main house...which was also very spacious. We had our 4 families in this house/and in-law suite and it was perfect. Large kitchen, large family room, ping pong and pool in lower level. One of the greatest things was the deck. It was HUGE! We gathered here mostly when at the house...from yoga every morning, to margaritas in the afternoon, and lobster bakes in the evening. Plenty of seating and tables. And we even had dinner outside one night in a rain storm, due to the perfect overhang roof with skylights! Walk right across the street for the lake and nature walks. Short walk/bike ride to the beach, too. Also, handicap accessible...we used this for our strollers, great for not waking up little ones! Thank you for choosing our home, we are looking forward to your family staying with us again! What is really nice is all the variety of age groups and what a fun time everyone had! Friday to Friday rentals only during high season! 2018 May 25 Memorial Day weekend, June 1, 8th-15th, June 15-22h: Main House $3,850/week/In-Law Apt: $1,200 FRIDAY-FRIDAY rentals! 2018 June 22 & 24, 29 July (or any part of July) & August: Main House $5,500/week In-Law Apt: $1,500 per week June 22, July, August, All holidays, shoulder season in-law apt: $900 ALL Holiday weeks: RENT/WEEK $5,500 MAIN House/$1,500.00 In-Law Apt CALL-SPECIAL RATE FOR 2 or more weeks and for those renewing lease year after year. Check in: 2 pm Check out:10 am Special Weekend Rates available off Season-please call or email-3 night minimum $550/night. Add the In-Law apartment with the main house rental to expand your space and have more areas for visiting families and kids! In-law apt. is available ONLY with the main house rental - otherwise locked off. Downstairs area is a huge recreation area with ping pong table and pool table for family fun! Garage area to park bikes or an extra gathering area for arts and crafts on rainy days or just an extra area to have fun!